When I saw that this month’s challenge was going to be Cinnamon Buns, I laughed. Although I have never had cinnamon buns before, I share with these yeasty treats a funny story. It all started less than two years ago, my hubby and I were entering the mall when I started feeling nauseous: “The smell of cinnamon is so strong today, almost repellent.” I told him. “ I don’t smell anything.” He replied, noticing that I really wasn’t feeling good. "Are you pregnant?” he asked joking. A few days went by and I confirmed that I was indeed pregnant, and yes cinnamon buns were my free pregnancy test before the real revealing test. For the next nine months I couldn’t stand the smell of cinnamon and avoided to go pass cinnabon as much as possible. Thankfully my repulsion for cinnamon faded away after I had my daughter and I was really excited to make cinnamon buns for the first time, as I love everything that involves yeast and kneading. I made the buns earlier this month, as I knew I would be pretty busy later when moving out of our apartment. I didn’t want to add any nuts or any other spice to the dough because I wanted to experiment the authentic taste of the buns. The dough was wonderful to work with though I didn’t expect it be that soft. I preferred to use whole milk instead of buttermilk, and didn’t want to make sticky buns because nor my husband and I are adept of caramel glaze. 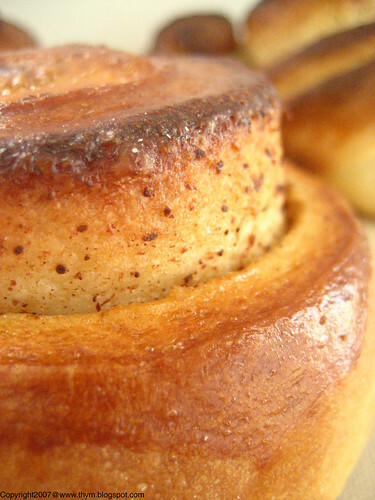 The smell of cinnamon buns in my kitchen was just fabulous, and they tasted wonderful as well. In fact I loved them so much, I ended up making another batch two days later. I glazed some of the buns and kept the others plain to dunk in my mug of milk. But something intrigued me in the recipe: the quantity of fondant glaze was just too much. I still have half of it in my fridge. So what to think about my first cinnamon buns experience? Well baking it twice gives you an idea of how much I loved it. The recipe is already in my repertoire and I even added a note to myself next time I make it: “Add more cinnamon, it wasn’t strong enough”. Thank you Marce for the recipe and for this marvelous choice. And be sure to head over to her blog for more details on the recipe. That is pretty funny that that was your pregnancy test. They look marvelous, I took pretty lame pictures this time, it was crazy enough making a bread product for the first time. Cinnamon as a pregnancy test. Who'd have thought! They look awesome, Rose. I´m very glad you like the recipe. There´s tons of other things you could do with the dough too, I´m planning on exploring different options soon. I think I´m gonna post the recipe a bit earlier than midnight here so that readers on earlier time zones don´t miss it. Oh and I loved your pregnancy test anecdote, it´s very funny. Hehe what a tasty pregnancy test! Good work on the challenge! Oh Rose, congratulation!.. Pls take care when you move as well, ok? Rose, when I initially read your post, I thought that you wrote that you are NOW pregnant. I almost wanted to comment "congratulations", then I re-read the post and saw that you were talking about what happened more than 2 years ago. LOL! I'm glad that you are no longer aversive to cinnamon aroma. I love cinnabuns and yours look utterly delicious! I want some now. So glad your reaction to cinnamon is now a positive one -- it would be a shame to miss out on baking these wonderful cinnamon buns. I think the aroma of warm yeasty bread with cinnamon is one of the most alluring scents in the kitchen. Awww what a cute pregnancy story! I'm curious now.. does your daughter like cinnamon? Your rolls turned out just gorgeous, Rose! Good luck in the move! That is a great pregnancy test! Cute story about your pregnancy. so lovely :) congratulations for this first and successful try !!!! THey look really good and I wish I could take one to dip in my tea this morning ! Your buns look great. I too thought that there wasn't enough cinnamon. Haha, what a funny pregnancy test! :-) The buns look great. I agree on that there was too little cinnamon in the buns. More cinnamon for me too please! Your first bun experience looks like a delicious one. I cut way back on the fondant glaze as I only made half cinnamon buns and my daughter disappeared with the leftovers! Loved the story! :) Although I'd hate to be sensitive to cinnamon for nine months! Great looking buns! So funny, as I am going thru my blogs today, so many of you are doing the bakers challenge! You folks are making me so hungry for buns! But...I am not a baker at all, so I am enjoying everyone's submission. 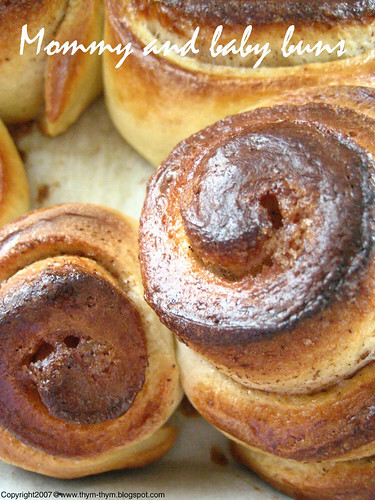 What a great post Rose and your cinnamon buns look lovely! Excellent photographs! And I love the story about finding out you were pregnant. I couldn't stand the smell of Chanel No. 5 with my first pregnancy, which used to be my favorite fragrance (I still can't stand it after three children and many, many years...). Congrats that your first time making the rolls turned out so beautifully! 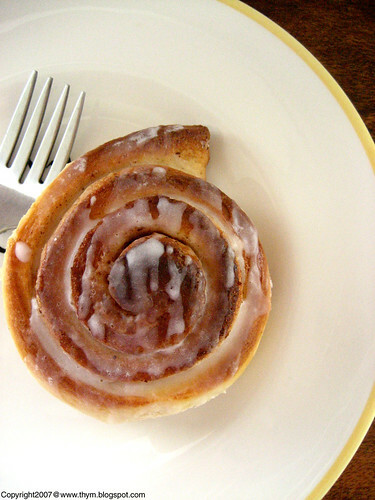 I love cinnamon buns - they remind me of Canada! I am working up the courage to apply for membership with the Daring Bakers. It looks like so much fun. What a great story about the smell of cinnamon. Your buns are lovely looking and you did a great job Rose as usual. *Geez* I must have been sleeping yesterday reading your post. Lucky I checked back and realised how wrong I was. Funny story Rose and sorry for the my stupid mistake! Great story and great buns too! I agree that I'd have liked more cinnamon and there was too much icing as well. But this was a grat challenge and you did it so well too! Love your story! The photos of the buns are gorgeous! Great read again Rose! The buns look awesome and so plump...if only my hand could reach across the screen! That's a cute cinnamon story...and I'm so glad you came around to loving cinnamon again after your little girl's arrival. :-) Your cinnamon rolls look really lovely, and I like your idea of leaving a few unglazed to just enjoy for their nice subtle flavor and texture. Cute story. And speaking from someone who has a history with caramel, you really should try the sticky buns... they are easier than I expected, for sure. That's such a cute story, Rose! Lovely buns! This was a great recipe, wasn't it!! I guess when we decide to have kids I will have to take trips to the mall for that free pregnancy test!! That was too funny! Lovely buns - I hope you shared them with an appreciative family, and that your previous little bun-in-the-oven enjoyed the cinnamony flavor. Hehehe pregnancy can do some funny things. Great job on the challenge, they look great! Your buns came out lovely...glad you liked the challenge. I too agree with you about the icing, it was way too much. Good that you've recovered from your cinnamon aversion. The buns look fantastic! I know a few women who've had that adverse reaction to cinnamon when they were pregnant. I wonder what it is. I love to dunk my cinnamon buns in milk, too! Wish I had one of yours to dunk right now ... oy. Oh I forgot to post on yours, I'm truly sorry, but they look yummy and delicious! These look fabulous. I really intensely dislike sticky buns and somehow, most cinnamon buns also seem so goopy and wet with filling and icing that they are inedible for me. These are absolutely PERFECT! Thank you!